When a high blood pressure patient visits a doctor, the most common treatment that is given for that is drugs of some composition that helps in levelling the blood pressure. And the patient is also given various ways of diet control methods by which the regular heart beat and adequate blood pressure is maintained. But usage of drugs is not always good as they may cause side effects, and also dietary control can lead to hypervitaminosis or also deficiency of vitamins to some extent is some food intake is controlled. 1. Control salt intake – When people can’t think to control their diet or food intake, the best way to control your blood pressure is by decreasing your salt intake. The normal requirement of Salt to an adult human body is 0.5 grams. But about 6 grams of salt is taken all over every day. Higher sodium concentrations may lead to high blood pressure which further leads to heart disease and stroke. 2. Control your weight – Over weight or obesity can lead to cardiac failure and high blood pressure. So the weight of the body has to be controlled to a certain level which depends on the height and age of the body. There are many ways by which you can control your weight by not decreasing your food intake. By always physically active, being bedridden may make you obese very easily. 3. Smoking/Drinking – Avoid drinking alcohol or smoking cigarettes. They are one of the major factors which lead to heart and kidney diseases through high blood pressure. 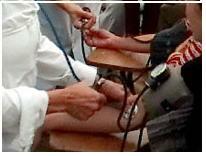 Drinking more than twice a day can cause high blood pressure. For a heavy drinker, it is difficult to control blood pressure by any means. Nicotine, a chemical in tobacco of cigarettes causes constriction of blood vessels and lead to higher blood pressure. Direct smokers or second-hand smokers, both have the risk of high blood pressure. Smoking through high blood pressure can lead to lung cancer, bladder cancer and heart disease. 4. Regular work habits – When at home or workplace, some small amount of works can always be good to maintain your blood pressure. According to a research, some lifestyle physical activity can decrease the systolic blood pressure by 10-15 points. Activities like working at the garden, or moving the vacuum cleaner, or other household activities. 5. Exercise and fitness – Being active always helps! Healthy benefits are always seen when you are physically active and reduces the risk of cardiovascular diseases. Swimming, cycling, jogging, skiing, aerobic dancing, walking are the various types of physical exercises. For people aged between 18 and 65, hourly exercise five times a week is enough to maintain good and healthy heart. Then comes the drugs which are prescribed by the doctors/physicians which can reduce BP, but the 5 above need no advice of doctors, and are very natural methods of controlling BP and saving you from diseases. Medical History in Dentistry – Why is it asked? What is asked? Hi, I have just stumbled upon your blogs and find them very interesting. I enjoyed your internet marketing blog too Dr. Chetan. Coincidentally I have a lens on how to reduce blood pressure at http://www.squidoo.com/reducebloodpressure and find your info here very helpful. I will link to this page next time I update the lens. celery cucumber juice (with a small bit of raw garlic) 3 times a week lowered mine by 10+ points on both measurements without doing anything else. Doesn’t taste the greatest but works. I am a chronic kidney failure patient for six years now. I really have a problem with my blood pressure which rise up to 200/100 and I am scared. my medicine does not have effects anymore and I do not know what else to do. Please Advice. my all the tests that i have told above are clear…..